We understand that consumers in the Portland and Vancouver area are concerned about the environment as we are. It is because of this that we search for the best products available to support the importance of providing clean water to our customers while still caring for the environment. When you are turning on the faucet for a drink of water or washing dishes after dinner, you want to know that the water you are using is clean and protected for your family to use. What is a Contech Storm Filter? The Contech system has filter cartridges in it. The water enters through your catch basin The water flows through the cartridges, the media inside the cartridges filters the contaminates out and the water then flows out of the vault into the stream, or storm sewer system. Did you receive a letter from your local municipality telling you have a Contech Storm Vault on your property that requires maintenance? This is fairly common as the Contech systems require a annual inspection by a Certified Maintenance Provider. In most cases the local municipality will require a copy of this report. Columbia Drain can provide you with the required inspection. How do I maintain my Contech vault? Not just anyone can provide the services to inspect and maintain your Contech system. It takes the experience and expertise of a company like Columbia Drain. 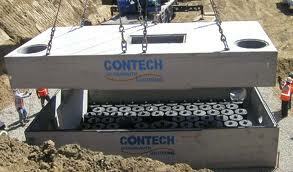 At Columbia Drain, we are a certified maintenance provider for Contech Storm Systems. The vault requires a confined space entry permit, just to go in and service the cartridges. Once inside we will remove the spend cartridges, remove all of the debris from inside the vault, and wash down the vault. We will then install OEM refurbished Contech cartridges. Columbia Drain will clean all of the contaminated media from the spent cartridges, dispose of it at a approved site, and return the cartridge bodies to be cleaned and filled with new media, so they can begin the filtering process on another site. Once completed Columbia Drain will send you a Certificate of Compliance, which is good for 12 months, a copy of the before, during and after photos, as well a copy of your dump manifest. Your dump manifest shows you exactly where the contaminated waste was taken. Columbia Drain will provide you with the required ongoing inspections to keep your BMP’s up to date.